Calling all Influencers who want to make an IMPACT! Applications are now open for Organic Trade Association's first-ever Influencer Program in conjunction with Organic Week D.C. May 20-22. Year after year, organic businesses converge in Washington, D.C. for the Organic Trade Association’s signature advocacy and policy-making event, Organic Week in Washington, D.C. This year, #OrganicWeekDC is all about the organic sector doubling-down on big ideas and better solutions. In the backdrop of the nation’s capital, we’ll explore leading-edge thinking, discuss bold strategies, and take incremental steps to advance policy and private sector solutions. These days, marketing professionals across a wide variety of industries are deciding how they will incorporate Influencer Marketing into their brand strategies. In addition to answering this question, organic businesses are asking themselves how organic activism aligns with their brand strategies. There is no better time to bring together Influencers and organic businesses to explore these opportunities. Organic Trade Association will invite social media Influencers and brand ambassadors to Capitol Hill to see advocacy in action and cover the event for their own audiences. Influencers who are selected to attend the event will be invited to participate in a wide range of Organic Week D.C. meetings and activities. Arriving Monday, May 20, participants are invited to attend social media and advocacy day trainings during Member Day, and join Organic Weekers on a Capitol Bus Tour in the evening. On Advocacy Day, Influencers will hit the Hill with OTA members for Hill meetings and get a first-hand look at how organic businesses go above and beyond brand strategy to advocate for organic policy priorities. They will be invited to join us at the Congressional Reception following Hill meetings, and to attend the Bold Ideas and Critical Conversations as well. Along the way, Influencers will chronicle the event on their social channels and follow up with a blog post about their experience – bringing even more public awareness to #OrganicWeekDC and the organic businesses that are doing the work to keep organic thriving. To apply, Influencers must prepare a short statement (200-500 words) about why they are interested in attending, as well as links to their social channels and blog or website (if they have one). Influencer applications are due by April 15. Selected Influencers will be announced April 26. Travel and lodging (3 days, 2 nights) will be covered for Influencers who are selected to join the program. If you have any questions about the application process, please contact Kelly Taveras (ktaveras@ota.com), Digital Specialist for the Organic Trade Association. Upon submission of this form, the Organic Trade Association will verify your eligibility in the program and contact you with the Organic Fraud Prevention Solutions Guide and next steps. A vulnerability was revealed in the organic supply chain via a complaint that the United States Department of Agriculture’s (USDA’s) National Organic Program (NOP) received regarding non-organic grains and oilseeds being imported from Turkey and fraudulently sold as organic in the United States. The Organic Trade Association’s Farm Bill platform calls for full support and adequate funding for the USDA National Organic Program (NOP) to keep pace with industry growth, set uniform standards, and carry out compliance and enforcement actions in the U.S. and abroad. It advocates for organic-focused research, risk management tools, data collection and direct dialog between industry and USDA that are critical to organic farmers’ success. Growing up on a dairy farm in Southern California, Stephanie Alexandre spent time with the cows as soon as she could walk. Soon, she was helping her parents with the chores. 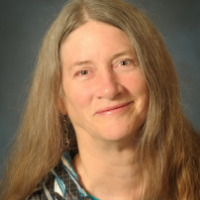 As a child, she loved showing her dairy cows in 4-H competitions, leading her to pursue an agriculture business degree at California Polytechnic in San Luis Obispo. 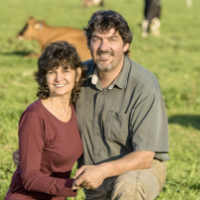 There, she met her future husband Blake Alexandre, a fourth generation grass-based Northern California dairy farmer, who is an entrepreneurial man with a passion for leading, both cows and people. They began dairying in 1988 in Southern California. Immigrating to the United States in 1986, Javier Zamora worked in the service industry in southern California for 20 years before going back to school at the age of 43, earning his GED and a degree in landscape design before enrolling in the horticulture program at Cabrillo College. Sharpening his farming skills through the Agriculture and Land-Based Training Association (ALBA), he started farming organically in 2012 on 1.5 acres. 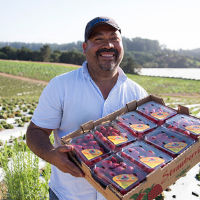 Today, as owner of JSM Organics, he farms over 100 acres on California’s Central Coast.